The absolute method is used to directly determine the moisture content of a sample (e.g. weight loss by drying). These methods include drying in the drying cabinet, infrared drying and micro-wave drying. All three methods work thermogravimetrically. Indirect determination is carried out by means of the derived methods. A physical property is measured which is in connection with the moisture (e.g. absorption of electromagnetic radiation). These methods include the Karl-Fischer titration, the infrared spectroscopy, the micro-wave spectroscopy, etc. Why do different methods determine different material moistures? The drying cabinet evaporates – beside water – also slightly volatile constituents. Often the sample is not dried completely due to the weak heating by means of convection heat. The measuring value is above the water content but below the total moisture content. A micro-wave dryer evaporates - beside water – only low amounts of highly volatile constituents. Due to absorption drying – orientated to dipoles – the measuring value is very close at the water content and thus below the value of the drying cabinet. The Karl-Fischer titration method determines the number of water molecules by a chemical reaction. The measuring value corresponds to the water content with highest accuracy. • The Karl-Fischer titration to determine the water content • All other methods have to be adapted to one of the two methods, if necessary! For the traditional drying cabinet method, a hot air flow heats the sample from outside to inside against the flow of the rising moisture and the evaporation coldness at the surface. Often long drying periods are required. A drying cabinet is an apparatus to de-moisture an item mostly by de-moistening the air and using hygroscopic materials (sorbents). 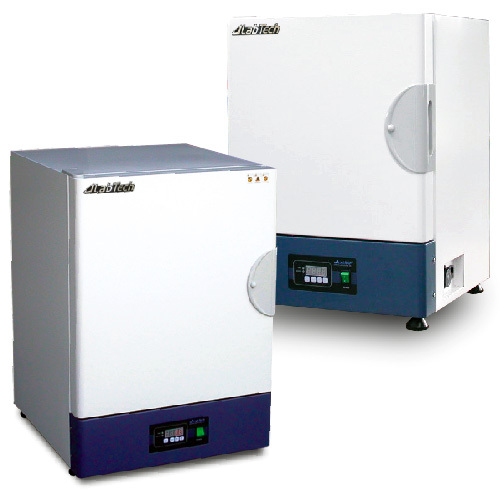 Drying cabinets are offered for temperature ranges from room temperature up to approx. 250 °C. This method is used to determine the amount of water content. Here, the specific reaction of water to a Karl Fischer reagent is used which contains iodine, sulphur dioxide and pyridine in the presence of methanol. This method can be applied either as coulometric titration or volumetric titration. For the coulometric titration, the sample is added to the Karl Fischer reagent and subjected to electrolytic oxidation in order to produce iodine. As the iodine is generated according to Faraday’s law related to the amount of electricity, the amount of water can be determined immediately according to the amount of electricity which is required for electrolytic oxidation. For the volumetric titration, the sample is added to an appropriate dehydrated solvent in a titration flask which had been dehydrated by means of a titrant. Titration is then carried out by means of a titrant with previously standardized titer (mg H2O/ml). The moisture content of the sample is determined from the titration volume (ml). 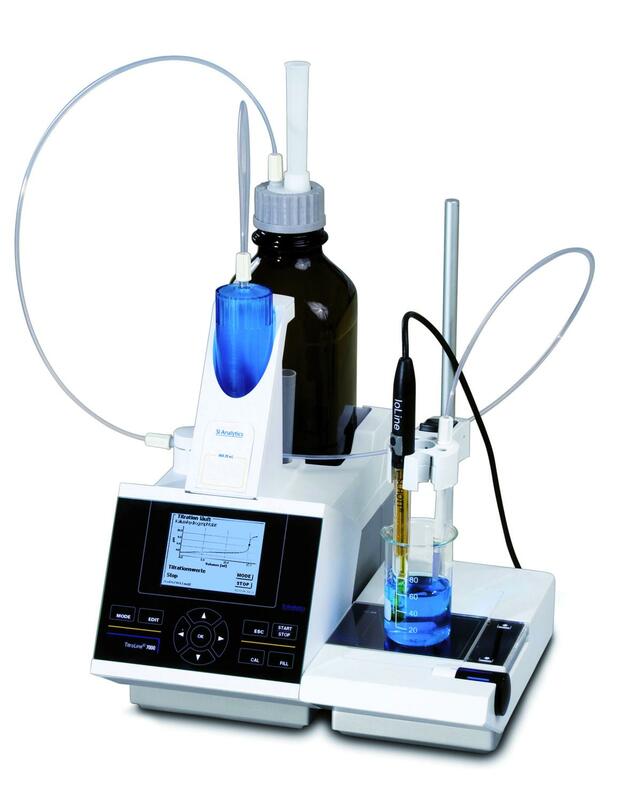 Automatic volumetric titrators on the basis of these methods are commercially available. 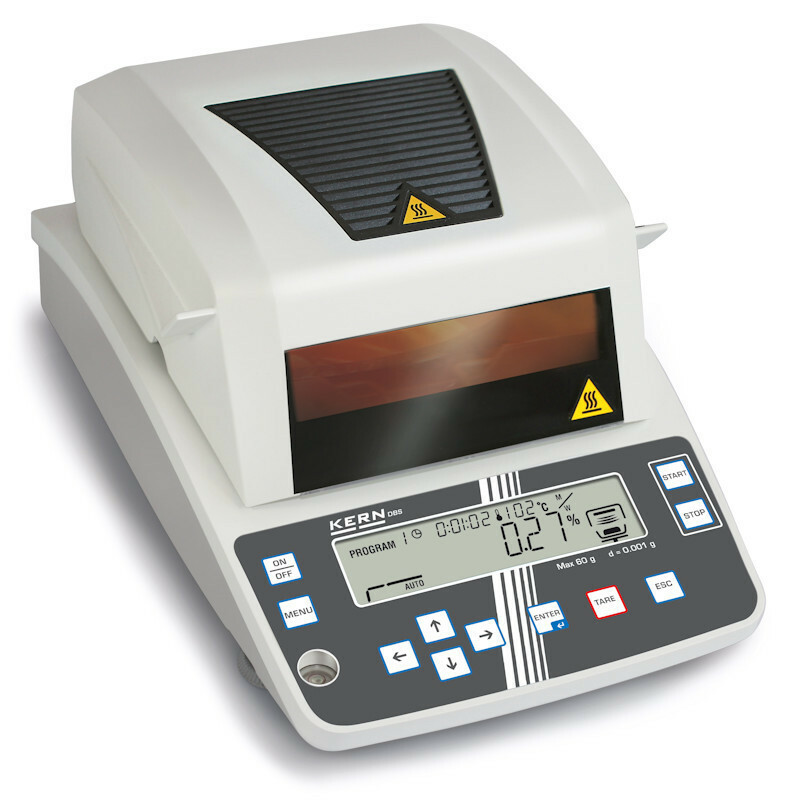 The KERN halogen moisture analyzer supplies quick and reliable measuring results. The instruments measure according to the principle of thermo-gravimetry. The sample is weighed and heated by a halogen lamp (infrared radiation). The weight loss is recorded continuously and drying is finished according to a defined criterion. 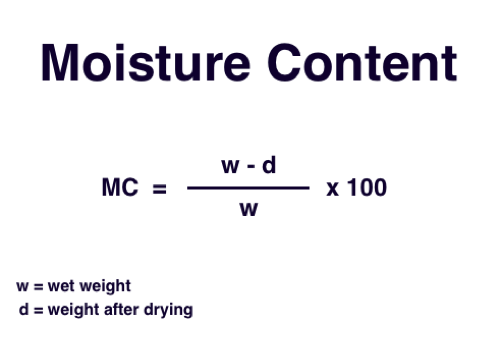 The moisture content is calculated automatically from the weight difference. Drying by means of halogen spotlights is a further development of the infrared drying method. During the drying process in a halogen moisture analyzer, the sample absorbs the infrared radiation of a halogen lamp. Radiation penetrates most part of the sample and is converted there in heat energy. In this way, the sample is heated very quickly. A low part of the radiation is reflected by the sample or passes the latter. The amount of reflected radiation depends to a large part on the fact whether it is a light or a dark sample. You know this effect from everyday life: If you wear dark clothes and stay in the sun you feel much warmer than when wearing a white shirt. In any case, a slightly lower drying temperature should be selected for a darker substance than for a lighter sample. The depth of penetration of the IR radiation depends on the permeability of the sample. At a lower permeability, the IR radiation penetrates only the top layers. Thus the heat conductivity of the substance is decisive for the further transport of heat into the deeper layers. The higher the heat conductivity the more quickly and homogenously the sample is heated. In the upcoming application notes, we will discuss the various applications of the moisture analyzer and how to carry out different measurements with it.